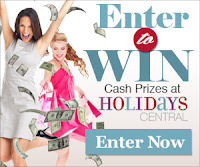 Browse » Home » Giveaways » Enter to win a $500 VISA gift card! Enter to win a $500 VISA gift card! Here's another great giveaway for all of you! Womensforum.com brings you the best in the industry, including coupons, style tips, parenting tricks, recipes, celebrity gossip, how-to videos, special offers, and more! Sign up for their sweepstakes and have the chance to receive a whole lot more! What: Enter to win a $500 Visa gift card for a new spring wardrobe. When: The sweepstakes runs from March 11, 2013 to March 31, 2013. How: Just simply head to our Facebook page and fill out a form; no purchase necessary. All you need to bring is your love of fashion!